Outwardly, there’s not a lot to give away that this is the highly anticipated next-generation Jeep Wrangler. For all intents and purposes, it looks like a present-generation JK Rubicon two-door with a mesh mask over its grille and a flat-gray paintjob. However, a closer inspection reveals that this is not exactly your run-of-the-mill JK. Among several giveaways is a suspiciously low-hanging rear fuel tank. At first we thought it could be a diesel exhaust fluid (DEF) tank for the nearly certain diesel option, but we believe it’s just laying low because of the kludged body attached to the new chassis. On the right side there’s what appears to be an electrical sensor wire running from underneath the hood and into the cab, indicating powertrain development testing. So what do we know for sure about the new JL Wrangler? We’re confident it will still have solid axles front and rear, a conventional two-speed transfer case, and a body-on-frame construction. There might be some aluminum on it, but we’ve been assured it will remain predominantly steel. Most models will get an eight-speed automatic, although we expect the six-speed manual to continue to be available. 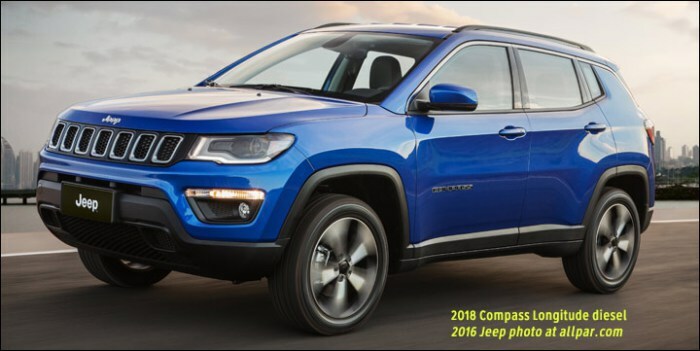 It will most likely get the next-generation Pentastar just announced for the 2016 Jeep Grand Cherokee as standard. The diesel option could either be the 3.0L VM Motori EcoDiesel used in the Ram 1500 and Grand Cherokee or a 2.8L or 2.2L I-4. Regardless, expect at least 300 lb-ft of torque and well more than 400 if it’s the V-6. The solid front and rear axles on this mule look to be significantly beefier than they are on the current Wrangler JK. Not only will these tougher axles provide better off-road performance and durability, they’ll also allow for other body configurations to enter the mix. As before, the Wrangler will come in short- and long-wheelbase styles, but, like we reported earlier this week, Jeep’s iconic off-roader will once again be available as a compact pickup (unseen in the Wrangler/CJ lineup since the dearly missed CJ-8). Those heavy-duty axles should safely enable a payload of at least 1,000 pounds in the Jeep pickup’s bed, to say nothing of the added weight of the longer frame and body. It’s yet to be ascertained whether the Wrangler truck will be a single-cab shortbed based on the Wrangler Unlimited’s wheelbase or if it will come with its own longer wheelbase. UPDATE: Sources can confirm that the Wrangler will be available with the 3.0L EcoDiesel V-6 and eight-speed TorqueFlite automatic transmission. There’s no word on whether a manual transmission will be available with the EcoDiesel. If you decide that you want a stylish, roomy mid-size utility vehicle—one that drives like a car—and you don’t need a third row, or any rugged pretense, then the Ford Edge and Nissan Murano are two of the better picks on the market. And if you narrow your priorities to vehicles that look conceived for adults—not just as rolling cribs and diaper bins—then the Murano and Edge stand atop an even smaller list. Both models are indeed stylish, mature, and sophisticated, but in very different ways. The Murano wears an especially bold face, with the new corporate ‘V-motion’ grille and boomerang headlights and taillights that frame some especially handsome contouring. Inside, the Murano has a swoopy, V-shaped design that’s equally radical, and distinct trims verge away from the woodgrain, piano-black plastic, and excessive brightwork that’s so common in premium interiors. The Edge, on the other side, looks sporty and athletic, with its contours and details feeling carefully calculated to fit right in with Ford’s existing lineup. On the inside, the Ford hits all the right cues for sporty and premium, although we think the Murano’s distinct look inside and out gives it a solid advantage in styling. Performance-wise, these two models are polar opposites as well. While the Ford Edge now relies mostly on turbocharged, so-called EcoBoost engines and six-speed automatic transmissions—a non-turbo V-6 is there as more of a token offering—the Murano goes a more traditional route underhood, with a naturally aspirated V-6 the sole engine for the lineup. In the Murano, it’s paired with a continuously variable automatic transmission (CVT) that does its job in keeping engine revs under control while all you notice is plenty of acceleration on tap when you need it—with little of the rubber-band responses that plagued former CVTs. On the other hand, you’re much more aware of the powertrain in the Edge, as it has crisp, well-coordinated shifts. And hold on before you think you’re getting a much more fuel-efficient vehicle with the EcoBoost Edge; it’s a virtual tie against the V-6 Murano. Ride and handling is very different between these two, with the Edge offering a rather firm but muted feel—more in line with German luxury crossovers, really—while the Murano has an equally quiet yet more plush ride that makes it a closer counterpoint to the Lexus RX. The Edge has a serious edge in handling, we think, as its precise steering and well-tuned suspension allow it to feel like a lower vehicle than it is when the road gets twisty. But considering the Murano’s strong, unobtrusive powertrain, we give the Edge only a slight edge here. One note: The Ford Edge is offered in a performance-oriented Edge Sport model, which adds a twin-turbo, 2.7-liter V-6, making 315 horsepower and 375 lb-ft of torque. With suspension and steering changes that bring a firmer, more communicated, plus serious appearance changes on the outside—most notably, brightwork replaced with a blacked-out look. Inside is where the Edge and Murano compare most easily in an A-to-B sense. While the two feel (and are) a virtual tie when it comes to cargo space, versatility, and general usability, we have to give the Edge demerits here for its flat, unsupportive seats. The Murano’s back seats especially shame those in the Edge, with their excellent contouring in outboard positions, while in the Ford the frame of the Vista Roof can interfere with headroom for taller occupants. Full crash-test results aren’t yet available for either of these recently redesigned models. Both of these models save some of their best active-safety technology—like Predictive Forward Collision Warning on the Pathfinder, or Lane Keep Assist and inflatable rear seatbelts on the Edge—for option packages on top-of-the-line models. Feature-wise, both of these models are presented with a sort of two-pronged approach: with tantalizing value-oriented base models that offer an interesting alternative to smaller, more mass-market models, as well as fully-kitted-out top-trim models that match up against luxury-brand models in all but the badge. At the base level, the base Murano S comes with a bit more than the Edge—with dual-zone climate control and a decent apps-compatible infotainment system standard—but at the top end we’ll call the Edge the winner in the features race by a slight bit, as it can be equipped with things like an Active Park Assist system that will let the Edge park itself, even into a perpendicular spot, as you manage the accelerator and brake pedals. Who’s the winner here? The Edge only has it if you place more weight on handling, and a more European feel (especially with the Edge Sport), or if you really must have the edge on technology features. Otherwise it’s the Murano, as its like-no-other styling, plush ride, confident performance, and very comfortable seating add up to something that’s quite compelling. Ram Man tipped us off to the 2015 Black Ram 1500 Express (in Canada, Ram 1500 Black Sport), a pickup truck with blackened headlights, badging, wheels, mirror cases, and paint. Builds on the Ram 1500 Sport package, which includes a Hemi V8 and eight-speed automatic, it also has a “sport performance” hood, unique 20-inch wheels, dual-zone automatic temperature control (except regular cab), and nine amplified speakers. The Ram 1500 Black Sport package (26L) is only available in “Brilliant Black Crystal Pearl” but comes in regular, quad, and crew cab formats. The normal price for Ram 1500 Sport is $36,150 (regular cab, short bed, rear wheel drive). Ram Man wrote that the package price was C$1,795 in Canada, which equates to around US$1,415 given an unusually strong U.S. dollar; chances are it will run at least $1,495 in the US to account for short-term currency changes. The truck is now shown in preproduction form on Ram’s web site, with the slogan, “black on black on black.” The dual exhaust tips are chrome, but little else deviates from the black theme. Last August, longtime Chrysler executive (he’s been with the company since 1988) Robert Hegbloom took the position of CEO of Ram Trucks. Now that he’s had time to get comfortable with the reins, we sat down to talk sales numbers, EcoDiesel, mid-size trucks, and more—much more. Car and Driver: Ram sold 395,567 trucks in 2014, placing it in fourth place in the bestselling-vehicle derby behind the Toyota Camry (396,988), the Chevrolet Silverado (471,918), and the Ford F-series (679,496). Safe to call it a big year? Robert Hegbloom: We were up 28 percent year over year, and three points overall in the market. Basically, we look at our customers and see that they play in a number of areas: work, outdoor [recreation], motorsports, and even [just using the truck] as a family vehicle. And in those spaces, customers are looking for something unique. But the first thing with a light-duty truck is fuel economy, which is so different from where it was a few years ago. We want to deliver on fuel economy first, and then, depending on what their particular needs are, make sure we have the right package. Might the product lineup get diluted by the staggering amount of available trims and packages and submodels? Do you see consumers being overwhelmed by the number of choices? You know, it varies when regionalism comes into play. For instance, when you go down to Texas, the Laramie Longhorn is very popular, and there are some urban areas like Dallas, Fort Worth, Houston, and Austin, too, and they like chrome. Now when you go to California, they like the monochromatic look. You go to another part of the country and they have preferences, too. So you’ll have regional differences among the package preferences, and the dealers aren’t going to stock all of them. Well, we are delivering fuel economy using technology, like the EcoDiesel and the Pentastar V-6 mated to the eight-speed transmission. Then you add the enablers we put in place such as active grille shutters and aerodynamics. We still have the best aero in the segment, and we want to stay consistent there while looking for new opportunities in efficiency. Are the guys who buy diesel Ram trucks concerned with being green, or is it just about torque and fuel efficiency? Ultimately, it’s about delivering on fuel economy without sacrificing any capability. You get 240 horsepower and 420 lb-ft of torque and 29 mpg on the highway [with the EcoDiesel]. And to put that in perspective, consider that when we launched the 5.9-liter Cummins [in 1989], it had twice the displacement, yet made less horsepower and less torque. The 3.0-liter diesel delivers all the capability a light-duty buyer demands. Typically, consumers see a label and think they aren’t going to achieve the quoted mileage; what we’re seeing is customers writing [to us] about their EcoDiesel truck and saying they are getting 29 mpg or even better. Gas prices are currently at the lowest they’ve been in years. Is that slowing the sales of the EcoDiesel? Back in December, when gas prices were at their lowest, we had the highest-selling month YTD that we’ve had since the introduction of the EcoDiesel. We are at 26 days on lot with the EcoDiesel, even being a full year into the model’s availability and while we are increasing our volume. Typically we see much more fluctuation with gasoline prices than with diesel prices, so it doesn’t affect sales as much. Is there a cap on the number of EcoDiesels you can produce? We are trying to add 20 percent to our production. We received enough orders on this thing right out of the gate that took us almost to the model year [to have enough available units for sale]. You expect to get a big lift when you come out with something like that, but to sustain it for a year, that’s really something. Now the big question: Hellcat Ram? You know, we did an SRT a number of years ago, and it was something that at the time worked for a little bit. We get a few people who think a Hellcat truck would be fun, we could take it to Woodward Avenue and have some fun, but there’s not really a big appetite for that type of performance vehicle right now. Plus [Dodge chief] Tim Kuniskis wants all the Hellcat motors he can get. ProMaster City—what’s the early feedback? We need to get them out there. We started shipping in the end of December, and the people that have driven them have been pleased. The 2.4-liter Tigershark four-cylinder with the nine-speed transmission surprised a lot of people, as did the independent suspension, which we were very focused on, because we wanted the driving characteristics right. All three of those are major changes compared to what is in Europe. We took a great platform and optimized it for our market. I’m pretty excited to get them here. Is a diesel option for the ProMaster City in the cards? They have it in Europe, and the first time I ever drove one it was a diesel with the manual. But time will tell. We have the technology, but you start getting into the cost of ownership, which is a major driver in a commercial-oriented package. Acquisition price plays a big role in that, and I’m just not sure the appetite is there for that. What’s the possibility that a mini/mid-size truck based on the Fiat Strada will make it to the U.S.? The 2015 Ram 1500 ranks 1 out of 5 Full Size Pickup Trucks. This ranking is based on our analysis of published reviews and test drives of the Ram 1500, as well as reliability and safety data. The 2015 Ram 1500 impresses reviewers with its best-in-class ride, excellent cabin materials, responsive transmission and class-exclusive diesel engine option. Because it has the best combination of positive reviews and long-term ownership costs in its class, the Ram 1500 is the 2015 U.S. News Best Full Size Truck for the Money. The Ram 1500 has a base V6 that auto critics say has sufficient power. The optional V8 and turbodiesel V6 both earn praise for their ample power, and reviewers say either engine is a good choice for towing and hauling heavy loads. An eight-speed automatic transmission is standard, which reviewers praise for its responsiveness and smooth shifts. Fuel economy for a base Ram 1500 is an EPA-estimated 17/25 mpg city/highway, which is comparable with rivals’ estimates. The diesel model returns 20/28 mpg, which is excellent for the class. Test drivers say the 2015 Ram 1500 sets the standard for ride comfort in the segment, and they add that its optional air-adjustable suspension is helpful for keeping the truck level when towing or hauling heavy loads. Auto journalists are impressed with the soft-touch materials and build quality of the 2015 Ram 1500’s cabin. They say the interior is quiet at speed and note that the front seats are comfortable and supportive. In either Quad or Crew Cab configuration, both of which seat up to six, reviewers report that there is plenty of legroom. The Ram 1500 offers an abundance of storage spaces in the cabin, reviewers write, and they like its available lockable RamBox storage compartments for storing smaller cargo in sides of the bed. A USB port and auxiliary input jack are standard. Optional features include navigation, satellite radio, a rearview camera and a Uconnect infotainment system with Bluetooth and voice control capability. Test drivers write that Uconnect is very user-friendly and they appreciate that there are redundant physical buttons for most major climate and audio adjustments. With high sales of luxury trucks, an upgraded top-end Ram pickup is not surprising — unlike its 1968-Plymouth-Barracuda-like grille (actually based on an interesting piece of furniture, according to Ram’s chief exterior designer). Meet the new 2015 Ram 1500 Laramie Limited and 2016 Ram 2500 and 3500 Laramie Limited. Pricing has not been announced, but the outgoing models start at $49,320 (Ram 1500), $53,195 (Ram 2500), and $54,440 (Ram 3500). That is for the 5.7 liter Hemi V8, driving the rear wheels, with a crew cab, and a 5’7” box on the 1500 and eight-foot box on the heavy duties. 4×4 is extra; a VM diesel is available on the 1500, a Cummins diesel or 6.4 V8 on the 2500 and 3500. We expect the new models to have the same powertrain options and similar pricing despite interior and exterior upgrades. The chrome bumpers shown here are standard on some 2500 and 3500 trucks, optional on the full line. We believe the Ram 1500 will have a standard eight speed automatic while the 2500 and 3500 will keep the current six speeds (66RFE on 2500, with optional 68RFE; and 68RFE on 3500, with optional Aisin). The company has not announced any equipment upgrades, but the vehicles shown have sensors in the front bumper (including one in the side) which may be used for forward parking sensors (forward cross path detection would be an interesting addition). These are the second recent Ram trucks to break from the crosshair theme which started in the 1930s and have stuck with Dodge and Ram pickups off and on (mostly on) since then. For many more photos and more information, click here. The New Year may have just begun, but Ram has already hit the ground running with exciting news for Ram truck fans. On Tuesday, January 13th at the North American International Auto Show in Detroit, Ram Brand CEO and President, Bob Hegbloom, made two exciting announcements that prove Ram will remain a leader in 2015. First, Hegbloom announced that the new Ram 1500 EcoDiesel (available March 2015) would now deliver an incredible manufacturer’s estimated 29-mpg highway. We know that fuel economy is the customers’ top priority, which is why this truck will provide the highest fuel economy among all pickups in the industry. “The new 1500 EcoDiesel sets the bar even higher…and this truck will be great news for owners who tell us they really rack up the miles on their daily commute,” said Hegbloom. This was the strategy behind the newest truck model: The 2015 Ram 1500 Rebel. The dramatic, unique exterior styling immediately shows that the Ram Rebel offers something different. “It’s a truck built and styled for people who push back, whenever they hear those despised words: you can’t,” said Hegbloom. Instead of the crosshair grille you’d expect, the Ram Rebel sports a bold, blacked-out grille that frames the prominent billet silver “Ram.” The all-new face incorporates LED fog lamps, front tow hooks, a durable, black powder-coated bumper, and projector headlamps. For added strength, sport-performance, and traction, the Ram 1500 Rebel rides on 33-inch Toyo all-terrain tires. The Ram-stamped tailgate and blacked-out badging let others know who the leader is on the road. Like the outside of the truck, the inside is bold and rugged. The durable, unique seats feature inserts embossed with the actual Toyo tread pattern. The Ram Rebel features an all-new center console, and a heated steering wheel that will help drivers dominate both on and off the road. “With its distinctive good looks, high-value contenting and true full-size truck capability…it’s the perfect vehicle for people who always push the limits, and push themselves to squeeze more enjoyment out of life,” said Hegbloom. We listen to what truck owners want, and then we put everything we have into delivering it, always pushing what’s possible. We couldn’t be more excited to give you another truck so you can take living the “Ram Life” to a whole new, rebellious level. With the help of former Jeep engineer Bob Sheaves and others, Allpar has posted an investigation of what Jeep could use to power the domestic 2018 Wrangler, due to arrive sometime in calendar-year 2017. The choices are tough for the iconic Jeep, America’s heir to the famed military vehicles — which were far smaller and weighed half as much. On the one hand, higher fuel economy is likely to be needed if fuel prices rise, and if the government continues its demands for efficiency (for national security, balance-of-trade, and, ostensibly, for environmental reasons). On the other, the Jeep must still haul around over two tons of weight, while easily climbing difficult obstacles — and it can’t cheap out on torque. With that in mind, Wrangler is likely to come with at least two engines, one for economy in Jeeps that will not be challenged much by off-road driving; and one for those who will immediately tackle tough terrain. Indeed, given the popularity of the Ram 1500 Diesel and long-time demands of hard-core Jeepers, a diesel might even be in the cards, and Fiat Chrysler has several options there, too. This year’s winners of the prestigious Ward’s Top Ten were (in alphabetical order) the BMW 5-series electric motor, the Corvette Stingray’s 6.2 liter V8, the Dodge Challenger SRT Hellcat V8, the Ford Fiesta three-cylinder, one-liter turbo, Hyundai Tuscon fuel cell vehicle, Mini Cooper 1.5 turbo three cylinder, the Ram 3-liter VM diesel, Subaru WRX four-cylinder turbo, VW Golf 1.8 liter turbo four, and Volvo S60 with a four cylinder turbo. Chrysler was the only company to have two engines on the list, though one of them was made by Fiat’s VM. Ward’s noted that most of the 37 engines proposed for their top ten award were turbocharged fours, with just a handful of naturally aspirated V6 powerplants. There were five diesels in the competition, down from six. Four electrics were included, and three V8s, and three supercharged, two hybrids, three V8s, a fuel cell, and a scattering of other engine types. On the Hellcat, Tom Murphy said: “Despite brute force, you drive it, not the other way around… it was life-changing, that much torque… crept in under the price cap by $5, that’s with the gas guzzler.” It may have been the first vehicle to make the list despite a gas guzzler tax. They noted it was extremely quiet.